Brave Line, Bygg nr. H680 & H681 ved Austal Ships, Austal 50 "Rikula" & "Blue Magpie"
Austal Limited (ASX:ASB) today announced a major achievement with its first commercial contract award in Taiwan, valued at AU$44 million. The contract is for two 550 passenger, 50 meter high speed catamarans, designed and built by Austal for Taiwan’s Brave Line. The contract includes an option for a third vessel of the same design. “I’m delighted to welcome Brave Line as a valued customer of Austal. This contract builds on the continuing evolution of our fast ferry portfolio and reaffirms Austal’s position as international market leader for the quality of the vessels we design and build” Austal Vice President of Sales and Marketing, Ben Marland said. Austal Chief Executive Officer David Singleton added “Eighty per cent of the ships we build are for export with the design work centred at our Henderson facility. “Our 100-plus strong design team, the largest in Australia, is continuing to produce sophisticated designs that deliver against challenging customer requirements,” he said. “Austal has previously indicated continuing strength in the worldwide ferry industry and this adds to our recent record run of sales achieved over the last 18 months. We have a solid construction pipeline and many further export opportunities, some of which are well advanced, for our commercial vessel business. “In addition, in the defence market, we are currently bidding for the $3 billion Offshore Patrol Vessel program with our design partner Fassmer. This program which will see twelve vessels built in Australia for the Royal Australian Navy,” Mr Singleton said. The Brave Line catamarans will be designed by Austal in Australia and built at Austal’s shipyard in the Philippines. The shipyard has delivered 10 vessels for 5 international customers during the last 5 years. Austal has recently announced its intention to expand capacity in this shipyard through a US$30 million investment in new infrastructure. The expansion is intended to cater for an increase in new orders already achieved with further orders expected in the next 12 months. Her også, skikkelig spennende å se endelig design på disse 50m hurtigbåtene med 550-passager tall. Som alt i verden, er hurtigbåter under utvikling til nye standarder, kan ikke vente med å se endelig resultat på disse, blir nok litt av noen båter..! Great work by the team at Austal Philippines who have successfully launched the first of two new 50 metre high speed catamarans for Taiwan's Brave Line. The Austal Philippines team are successfully combining Austal’s industry leading intellectual property and maritime technology expertise with high quality and efficient local production capabilities to achieve customer focused solutions. The Austal Philippines team are guided by the values of excellence, integrity, teamwork, and the continuous enhancement of safe and hazard free facilities. Austal’s Philippines shipyard has delivered a 50-meter catamaran to Taiwanese Brave Line in what is the company’s first commercial contract in the East Asian country. 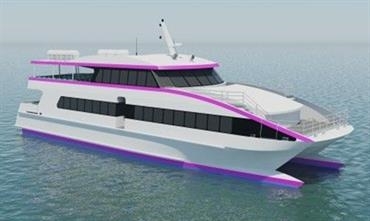 The Australian-designed catamaran is the first of two 550 passenger vessels being constructed at the Balamban, Cebu, shipyard under an AUD 44 million (USD 31 million) contract from September 2017. The two aluminium catamarans will be capable of carrying 552 passengers over 2 decks at a speed of up to 39 knots. “This vessel further demonstrates how Austal Philippines has established itself as a trusted and successful shipyard that produces high quality vessels for the worldwide market,” Austal CEO, David Singleton, said. The shipyard is also building the 109-meter high speed catamaran for Fjord Line of Norway. When complete, this vessel will be capable of carrying up to 1,000 tonnes and transporting more than 1,000 passengers and 425 cars at a speed of over 40 knots.